I get into the parking lot. Sniper is happy to see me and yells to Bradley that I am back. I slump down against my vehicle and whine out “Bradley I can’t do another lap”. I am assessed. Mongold finds out my problem seems to be I haven’t ate or drank for about 8 hours. Sniper and Mongold get water, coffee, soup into me. They let me sit down and warm up. My hands are shaking so badly I can’t get the soup to my mouth. A runner named Josh is there, who is going to run one loop of TWOT on Saturday. I don’t think Josh was impressed with what one looked like after two Loops of TWOT. He was planning on doing the traditional one loop on Saturday, and here I was, wrecked. Everything hurt, mostly due I believe, to the calorie deficit, and the tense body contracted against the cold. I was some punch drunk from the sleep deprivation. I felt awful. But Mongold had taken the day off from work and driven two hours to pace me. I felt obligated to try and do something-not the whole loop! Mongold said, well, let’s walk over to FDR 96 (we were now going to go clockwise) which was 10 miles, and says “Quatro will be there”. Apparently Q was going to have aid there. What the hell did I know? Okay, I will WALK over to 96, and then I will QUIT. We can use Q’s car, drive back to Camp David, and then return Q’s car to him. I had it all worked out. It was not a pleasant journey. I was whiny and slow. I told Mongold how unhappy I was to see him. I think we ran into a few Friday runners through here. When asked how I was, I honestly said I felt awful and I was quitting. We climb up Hankey, on the more gentle side, and I am looking forward to be done with this stupid nonsense. And the parking lot at FDR 96 is empty. He says he thought Q would be here, because where is the aid that was supposed to be dropped. We go to my aid, and I whip myself down on the ground. Now that the temperature is a bit warmer, Mongold can bang the water against the tree and get some water to break free from the ice chunks. I remark that didn’t occur to me last night. Now I don’t have a choice. I have to climb Big Bald and PRAY that some one’s vehicle is at Camp Todd. I eat and drink and start to get chilled and get ready to leave as Bradley tidies up the aid stash. This is probably the most interesting part of my mental challenge. Maybe this is where unconsciously, I really did not want to quit. The park rangers pull into the lot. In the back of my head, I hear the little voice saying “ask them for a ride. They will give you a ride back”. But I don’t really address it. I’m so sleep deprived and out of it, I’ve already moved on to thinking about climbing Big Bald. The rangers weren’t part of our “game”. I think if a VHTRC’er had pulled in, I might have been tugging on their car door and getting in, unasked. So I didn’t even say anything. Heck, I didn’t even think about this particular moment until the next day. But I was such a hot mess–er cold mess. I didn’t feel any better during this loop. The only place I actually broke into a pace faster than a walk was on top of Big Bald. The clockwise direction gave us a gentle little downhill for a bit. All people we ran into, I told them how bad I felt and I was not going on after Loop Three. I had serious ultrabrain. There was, of course, nobody at Camp Todd. I was forced to go on and finish the whole damn loop. To start Loop 4, Mongold worked on me for what is seemed like hours. I had told him at some point, IF I went out on a fourth loop, I had to sleep and I was not going to start a loop in the dark. I didn’t care about ending a loop in the darkness, but there was no way I was going to start a loop in the dark and the deep cold again. Mongold tried everything. He tried humor, shame, guilt, pride. He told me he could stay and do Loop 4, but we would have to start almost immediately. I did not cave. I told him I just needed to sleep. And I really did. There was no way I could have started Loop 4 at midnight and walked fast enough to not become hypothermic again. I also told him yes, I realized the odds of me starting a fourth loop were very slim after getting into my vehicle. I was aware of that. I honestly did not know if I would do a fourth loop. All I wanted to do was lay down. That was all I cared about. To stop moving, to close my eyes. It took forever to get off Grindstone Mountain and we were finally back at Camp David. Sniper made me some soup and I told Bradley I was going to sleep and then make a decision. I climbed into my sleeping bag and finally got to stop moving. When I first lay down I thought, okay, I will do a fourth loop. But as I woke up and moved around in my warm little sleeping bag, I changed that. No way. I’ll sleep and hide out in my vehicle until 10 am, then it will be too late. I knew if I was going to start a fourth loop, it had to be closer to daybreak in order to utilize the daylight hours. I woke up when runners started arriving. I had a call of nature, so I got some clothes on and stumbled out of the vehicle. I fully expected to be stiff and muscles totally cramped up. To my utter astonishment, I did not feel..that bad. My quads were a little tight, but really not as bad as I thought. I walk around the lot a bit, trying out the legs. Quatro says a few comments to me. I’m still mulling things over. I don’t feel that bad. (I don’t feel that GREAT either.) I will never be this close to a TWOT finish again. I have all day. It’s not even 8 o’clock yet. I can just walk the whole loop. I ask Sniper to make me coffee and soup. I drink an entire serving of my favorite recovery drink, Ultragen. I open my vehicle to get my stuff organized for a fourth and final loop. I’m taking everything with me, including my down jacket. I am NOT going to get cold out there. I have three lights. I have two Zunes, because I don’t know if either one has a charge. I have my phone. I type a text message. “Starting Loop 4”. There. It’s done. I am committed. Meanwhile, it’s almost time for the trad TWOT One Loopers to begin. I start ahead of them, because I am getting cold, and I get some yells of encouragement. Three minutes later, I step off the trail to let them run past me. Brian McNeil catches up. He is out for one loop, back from rehabbing a hip injury. Brian declares he is going to pace me my 4th loop!! I tell him that is great, but when he needs to go ahead, to all means go, I will be moving extremely slowly. Brian reiterates that he is going to stay with me, and by golly he does! I cannot believe how “good” I am feeling on this loop. I am not running, but I have a pretty clear head and a tiny bit of energy. It is amazing what sleep can do for a person. My legs do not feel too bad either. This is the best I feel since Loop One. Brian is a great pacer. He sets his watch at one hour increments, and we stop and eat and drink. I am usually hungry when we stop! I am now also able to stomach my solid foods-peanuts, candy bars, all the stuff that I couldn’t eat once it got cold out. The weather is cooperating in my favor also. It’s considerably warmer out today than any of the other days that I have been out here in the woods. I break the loop down into tiny goals. Brian and I are going clockwise. Get to the road. Then get to the road gate. Climb up Hankey (the easy side again.) Get to FDR 96. We run into Brian Keefer here. He was on his 3rd loop. 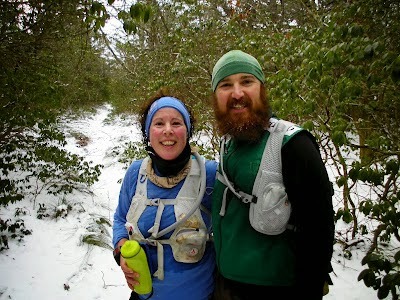 Brian and Keith Knipling were the other finishers of the full TWOT this year. Keith has also done this four times over! We also run into lots of runners. Now, when I say, lots of runners, this is still less than..twenty-five? But that’s alot of runners for a TWOT trot. Today I am happy to get their encouragement after quitting so many times to them the loop before. I feel “pretty good” on this loop and say so. I am also cognizant that I could crash and burn at any time, but man, Loop 4 is going so much better than Loop 3. I feel sorry for Mongold who had to put up with my whiny self. Camp Todd. A bunch of kids are out. I don’t spend alot of time looking to see what they are doing in a forest, in February. Brian and I cross the water (via the bridge) and start the LAST climb, up Little Bald. It’s still daylight. This seems to be going far more quickly than Loop 3. But THEN, there it is, the Famous Sign, the sharp turn. I always consider this the top of Little Bald. Now it’s going to be more of the descent. Brian and I keep up with the chatting. We get over the icy spots, now it’s dark, and I am back to the little bubble of light. It’s very hard to know where you are on this section, when it’s dark. I warn Brian that the last two miles will take approximately 18 hours to complete, as that is what it felt like on Loop 3. My quads are finally protesting quite loudly, and the downhill is tough to do. l.All I am looking for is the wet section of trail. When we hit that, we are 1/4 mile to the parking lot. FINALLY! The wet section of trail! Brian and I cross the three wooden bridges. I start to run. Probably 500 feet from the lot. My second fall in 107 miles. Brian picks me up and we emerge victorious to the crowds of well, David Snipes cheering.. I did it. I freaking did it. 108 miles. About 8000 feet of ascent per loop, so 24,000 feet of gain. I had mentioned to Brian earlier, that “this was the hardest run I’ve ever done” and he rattled off some of the statistics. True, I would still say Hardrock is harder-hey, even going up the dreaded Hankey Mountain, the only positive I could give it was the fact that I still had oxygen to breathe. I finished in 57.30 hours. This includes the 7 hour nap, 1/2 hour or so stop between Loop 2 and 3, and 1/2 hour stop between Loop One and Two. I am the 17th finisher, and 5th female to finish The Wild Oak Trail. Driving over to a hotel room I had reserved in Harrisonburg minutes later, two songs came on the satellite radio, and I smiled, because it seemed so randomly appropriate Nazareth “Hair of the Dog” followed by Iron Maiden’s “Run to the Hills”. I did not do this alone, in fact, left to myself I would have quit and probably been home in Ohio on Saturday, instead of wandering up down beautiful trails in Virginia for another day. Bradley Mongold for saving my run. David Snipes for assisting Mongold and feeding me. Kathleen Cusick for being my cheerleader and pacer early. Brian McNeil for turning my fourth loop into a rather almost enjoyable loop. For all the other runners who didn’t take me serious when I said I was quitting! As I tumbled into my clean hotel sheets on Saturday night, I felt more beat up mentally than physically. Jill mentioned “it was all between my ears” and perhaps, 95% of this event was for me. I’ve had several private mental reviews of the weekend so far. It’s amazing what you can do and what you perceive you CANNOT do. It’s amazing what can happen when friends believe in you. More than one person told me “they had no doubt I could do it.” Well, I certainly did. For probably a good 24 ( to 48 hr?) hour stretch, until I started out on Loop 4, there was plenty of doubt on my side. It’s good to have people who have more confidence in me than I have in myself. That, is great.